Perfect for party, wedding, photo shoot, pageant, birthday or other special occasions. ?? Kids girls princess flower formal long sleeve lace multi-layer tulle princess party dress, tutu tulle birthday floral girl's dress, holiday princess wedding bridesmaid prom evening dance gowns; ?? The Europe Style Vintage Embroidered flower is decorated on outside layer and top dress with exquisite design make the dress looks more lightsome and romantic. Long sleeve floral lace spliced bodice, hidden zipper at back, a bownot decor at the waist.Good material, pretty design, comfortable and elegant to wear,your girls will be fond of wearing;suitable for spring, summer, autumn, winter all seasons; ?? Soft and lace multi-layer tutu design, long sleeve and sweet elegant hemline.Satin Sash tie with big bow make the waist more slim and go with the noble temperament, in such a pure elegance on the elegant dress decorated above, add endless charm .Suitable for daily wear and special occasion like wedding party, holiday, christmas, beachwear, dressing up costume, birthday party, pageant, New Year, communion, easter, valentine's day, thanksgiving day etc; ?? Size Table means age ranges for girl, but they are for general guidance only. For most accurate fit, we recommend checking detailed measurement before purchase.Both gently hand wash and dry-clean are recommended. Use mild detergent and hang dry, but do not bleach, and use hot water,graceful tulle layered dress perfectly match your princess. ?? Would you want your princess freely dancing under the sunshine and be more confidence? Every girl has a princess dream in the heart, and we believe that each girl is a princess and need to be gentle treat. 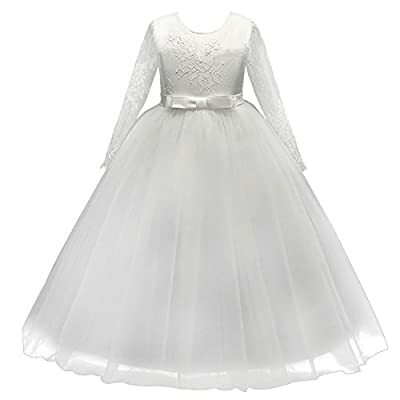 Tulle lace tutu long dress with floral lace spliced bodice and bow make your sweet princess to be the most graceful and shining girl in the crowd. Beautiful design features a chic style for your young baby and make your little fairy look so distinctive.